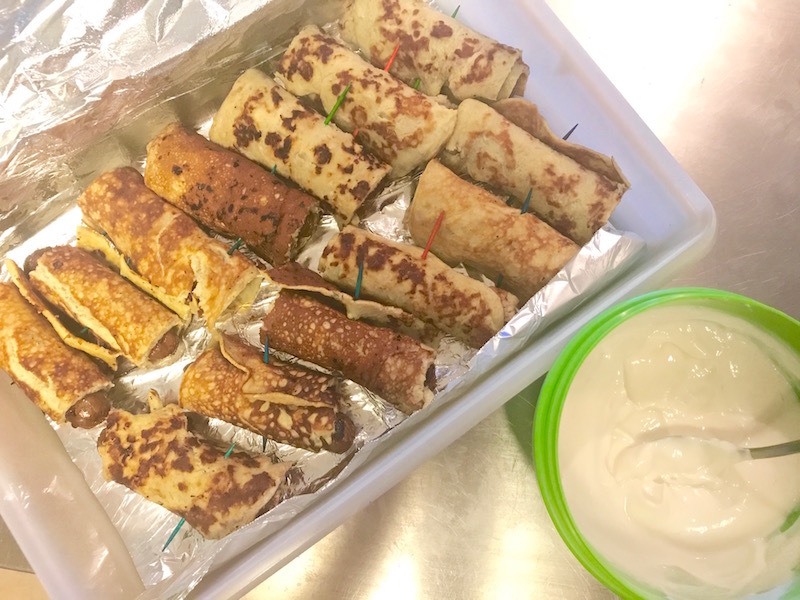 Make This at Your Next Brunch: Low-Carb Pancake Roll-Ups | Keep It Up, David! 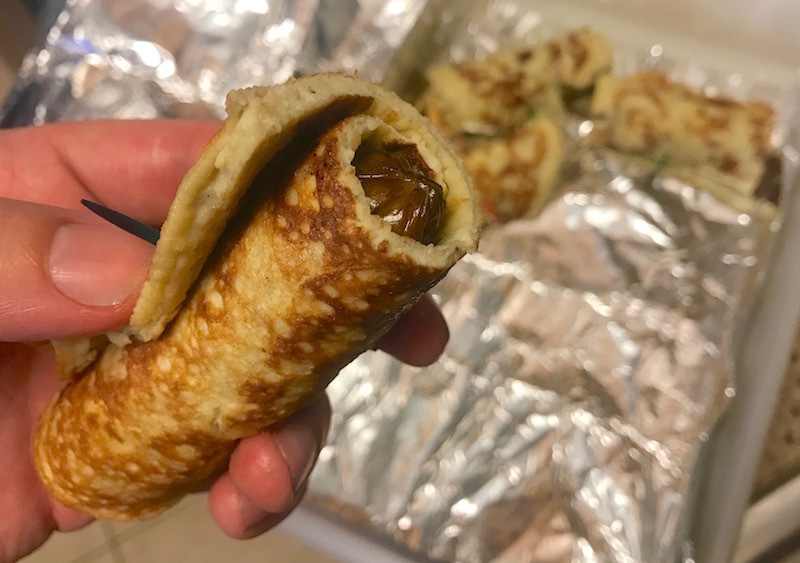 Low-Carb Pancake Roll-ups are perfect for brunch. 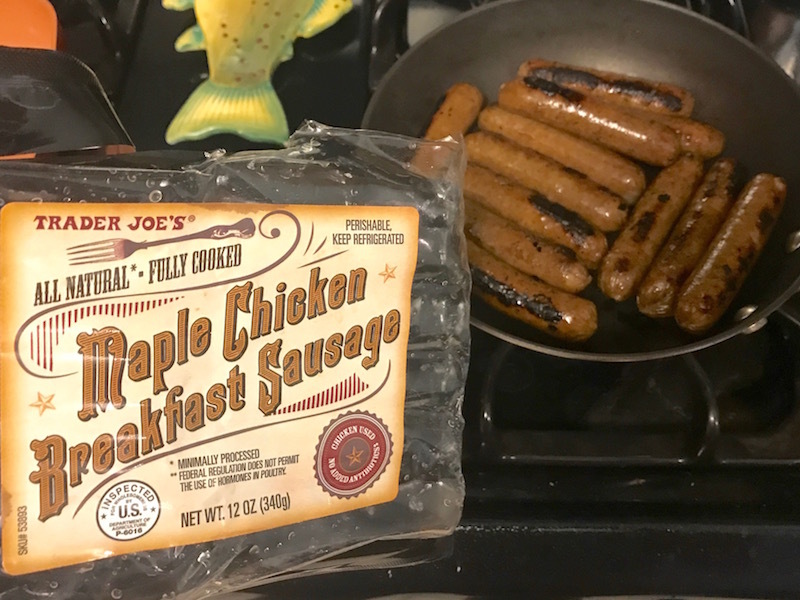 They’re great for other meals, too, and particularly versatile, because they’re a finger food, and everyone loves finger food. And what makes them low-carb? I’m glad you asked. 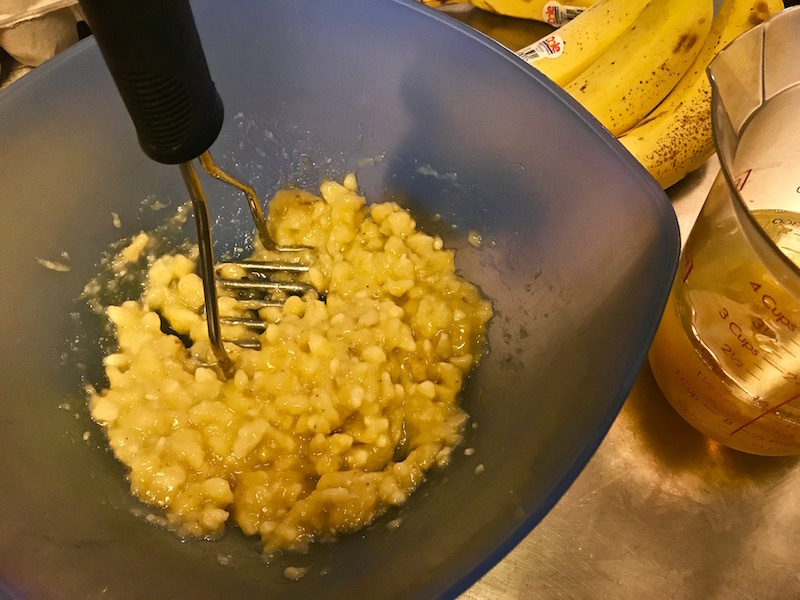 There’s only two ingredients in the pancakes: eggs and banana. No flour. No Bisquick. Nothing but eggs and banana. And those two ingredients make for a surprisingly satisfying pancake! 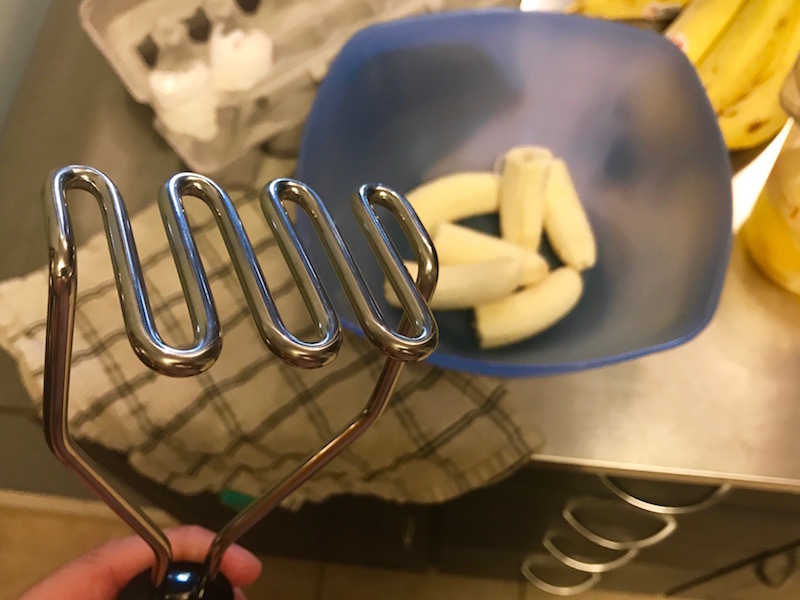 The ratio in the recipe is really simple: you need two eggs for every banana. Making a snack for yourself? Just use two eggs and one banana. Feeding a family? Triple the recipe. Feeding a crowd? Septuple it. (Yes, that’s a word.) You catch my drift. 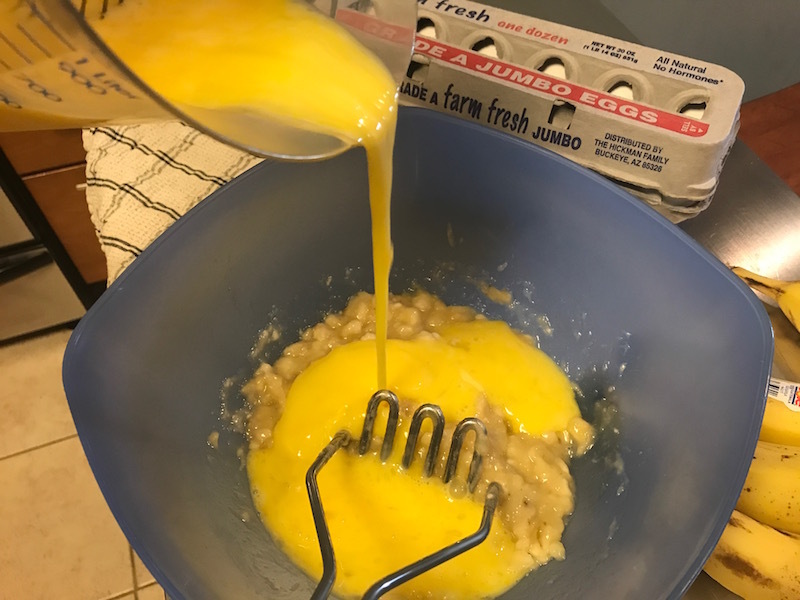 Then I added the six eggs, which I had already beaten together in a measuring cup. 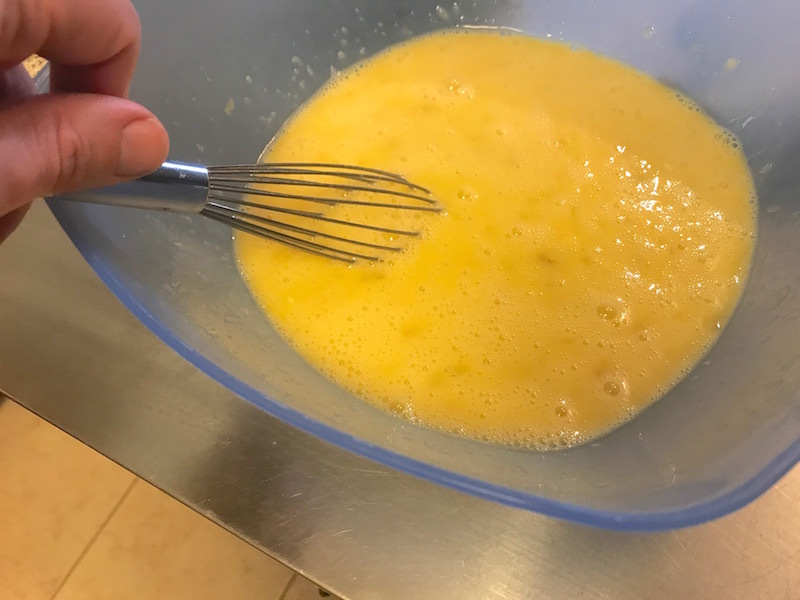 Whisked it all together, and the batter is done! If this seems repetitive, that’s because it is. 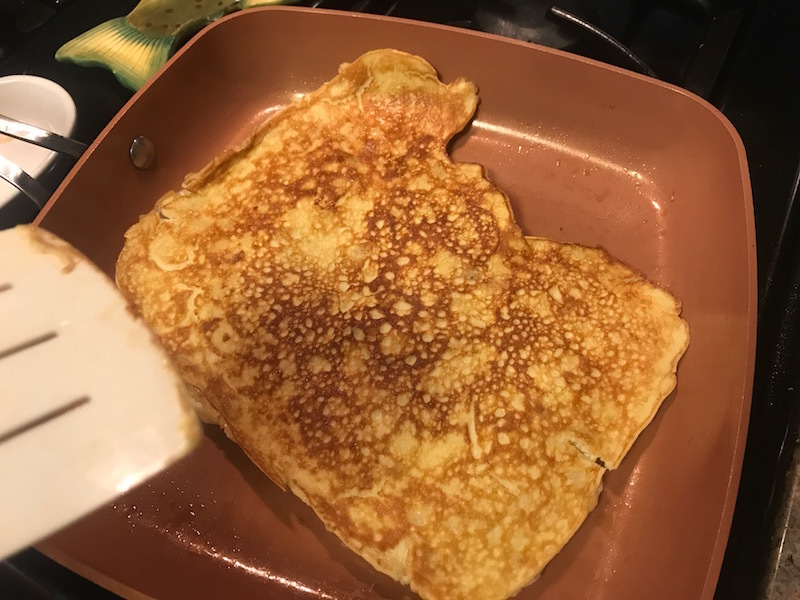 I mentioned two-ingredient pancakes in a blog post about my new copper pan a few months ago. But this recipe is a little more involved (but still very very easy), so keep reading! 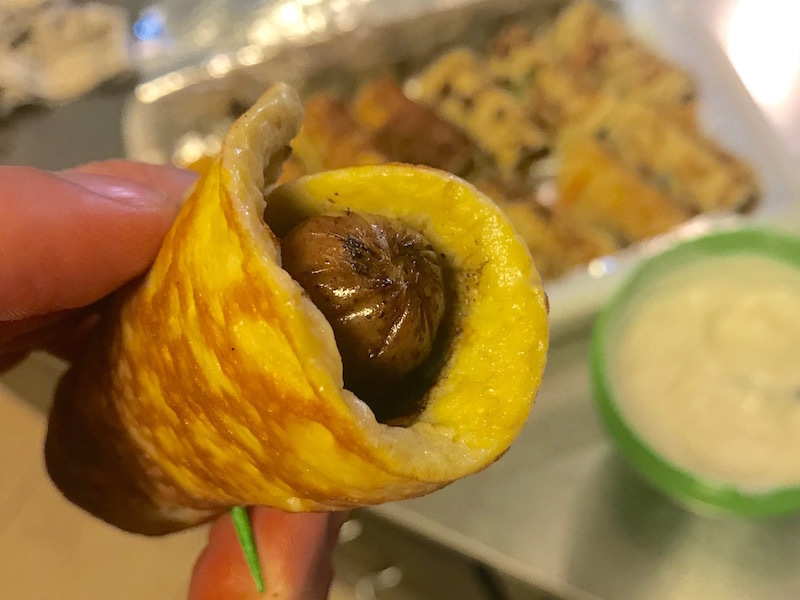 Two sausages fit perfectly across that pancake, end-to-end, so this is the perfect size for roll-ups. I secured each roll-up with a toothpick, since they have a tendency to unravel. I took these guys to a family pool-side get-together, so I concocted a dipping sauce, so they’d be handheld affairs. Here’s how to make Maple Yogurt Dipping Sauce. 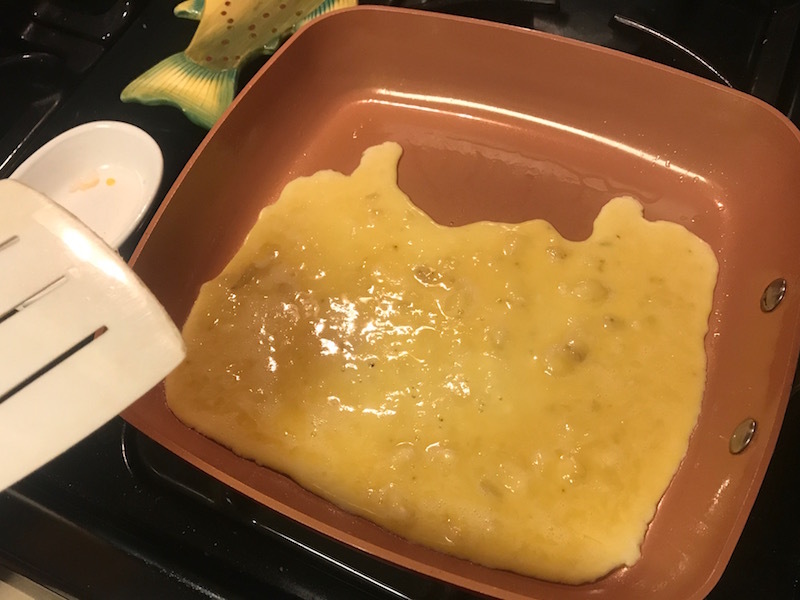 This dip, like the pancakes, has only two ingredients. Mix the two together. Use as much or as little syrup as desired. Done! 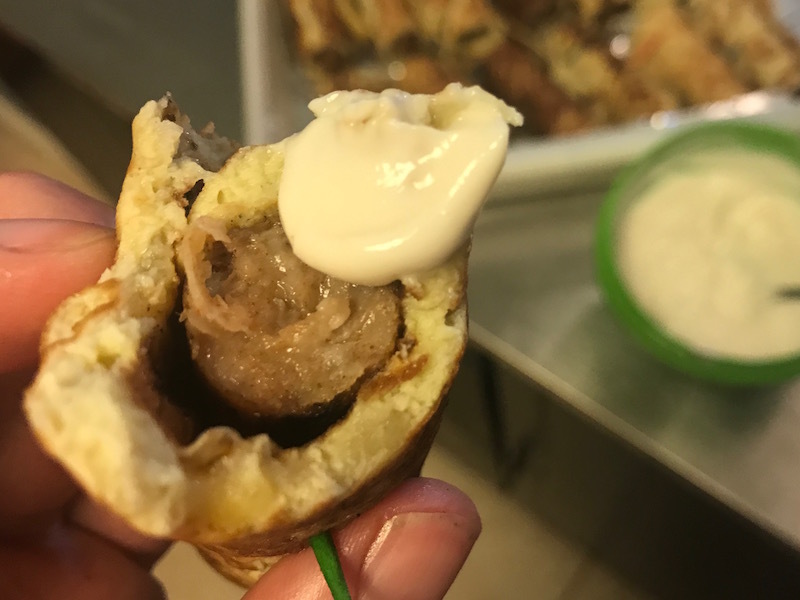 The dipping sauce adds the necessary maple flavor that’s a requirement with pancakes, and the yogurt adds a refreshing creaminess. It’s delicious! It’s a healthy, satisfying spin on a quintessential breakfast dish that you can enjoy without feeling any guilt. Who doesn’t love that? 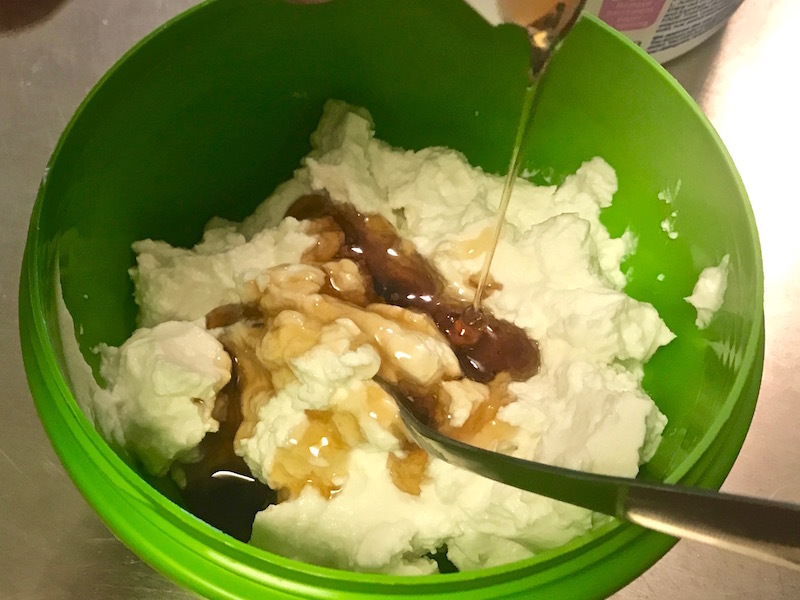 Check out many more healthy recipes on my Recipes page. This entry was posted on Sunday, June 18th, 2017 at 11:32 pm and is filed under Uncategorized. You can follow any responses to this entry through the RSS 2.0 feed. You can leave a response, or trackback from your own site. It looks so delicious. Keep up the good work .